Human Resources presents an opportunity to prepare for support staff annual reviews. Effective performance evaluations are a critical part of an employee’s professional development. Performance evaluations provide an opportunity for the supervisor to recognize an employee’s achievements, evaluate strengths, identify opportunities for improvement and set mutually agreeable goals for the next year. It also gives the supervisor and employee a chance to share feedback necessary for effective two-way communication. This training session will help supervisors and managers understand the importance of ongoing (year-round) performance feedback. Participants will also learn how to prepare for and effectively conduct evaluations. All managers and supervisors and other USI personnel who will have responsibility for evaluations are encouraged to attend. 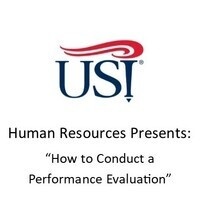 Register at https://www.usi.edu/outreach/lifelong-learning/usi-employee-development/performance-evaluation-training/ or call USI Outreach and Engagement at 812-464-1989.